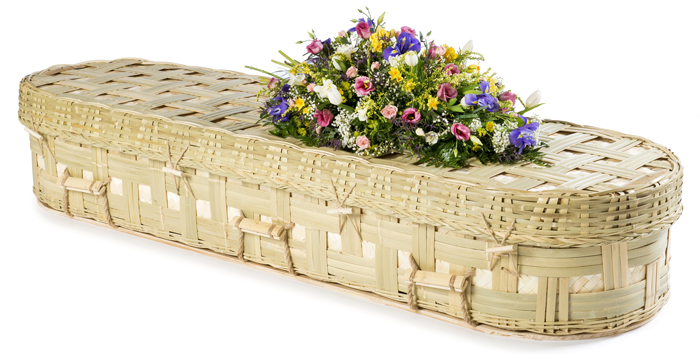 Our bamboo coffins are a traditional coffin shape or round-ended shape. These fairtrade coffins are popular for woodland burial as they are entirely bio-degradeable and from a sustainable resource. We have a plain Bamboo Eco (which comes in quite large sizes, up to 84×26 inches, the largest eco-coffin available) and the more ornate Bamboo Lattice. Our Bamboo Coffins are hand made in China from material grown and cropped in licensed plantations. Bamboo is the fastest growing woody plant in the world (up to 3-4 feet/day). When it is cropped it quickly grows back. Pandas do not eat the species of bamboo. The factory where the bamboo coffins are crafted in China have been awarded Fair-trade status. This is in recognition of the fact that we have enabled our craftsmen to prosper whilst maintaining their time-honoured livelihoods. They are transported by sea to the UK, “Russian-doll-style” – inside each other, maximising space thus minimising transport and fuel costs. The manufacturer calculates that the carbon footprint of our adult coffin from China to the UK uses no more fuel than a car journey of 4.63 miles. All our eco-coffins are suitable for traditional, green burial or green cremation. Other natural coffins available are crafted from; cane, cardboard, willow/wicker, pandanus, seagrass, woven banana leaves, and wool. These bamboo coffins are made from sustainable resources; they are 100% natural and biodegradable. They are very strong and tested to bear heavy loads.